As you may all know, I have a serious sugar addiction that I am battling. I give up sugar one week, then I'm back on it the next! So, if I get to eat sugar, I'm at least trying to eat unrefined instead of white, refined sugar. This recipe is insanely simple. It's not even really a recipe. 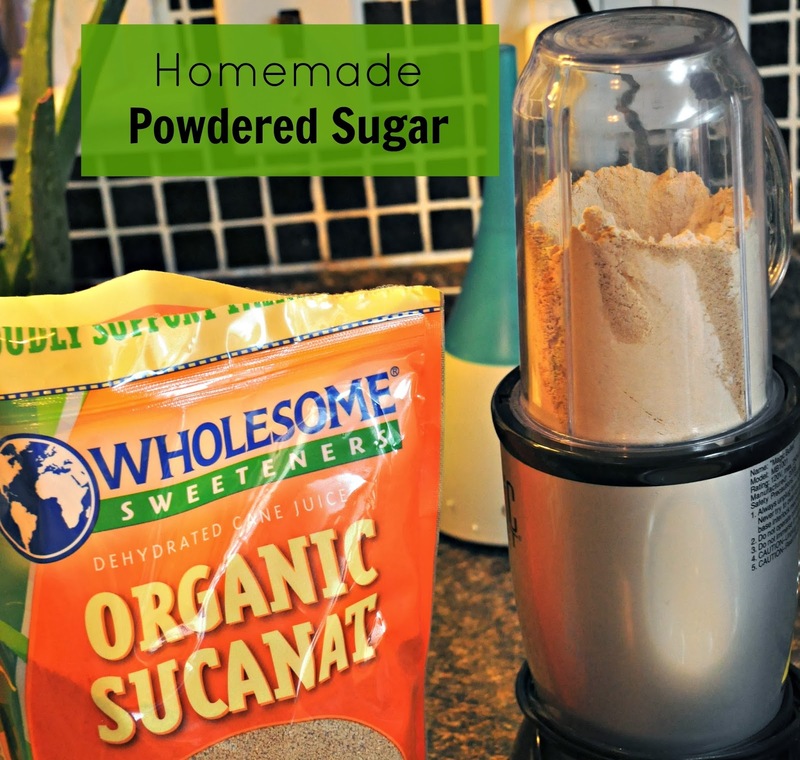 To make homemade powdered sugar, all you have to do it to put a granular, unrefined sugar, such as sucanat, coconut sugar, etc. into food processor, then blend it until it's smooth and powdered. The color of your sugar will vary based on which type of unrefined sugar you choose. Most of them will turn out looking slightly brown. I tried to use mine in a frosting recipe, but it looked like a gross chocolate frosting without chocolate. What good is that! You may as well go ahead and add the chocolate, so I did. You can use this homemade powdered sugar in SO many recipes! My dad is in the furniture industry. He gives us the scoop on certain things like furniture safety with children. You all may already know that kids can easily pull televisions and dressers over onto themselves, which can be extremely dangerous and sometimes fatal. All of that being said, we still had a close call with my older son and a dresser not too long ago. It was terrifying to hear the loud crash in his room, but before I tell you the whole story, I'd like to introduce you to Theodore. 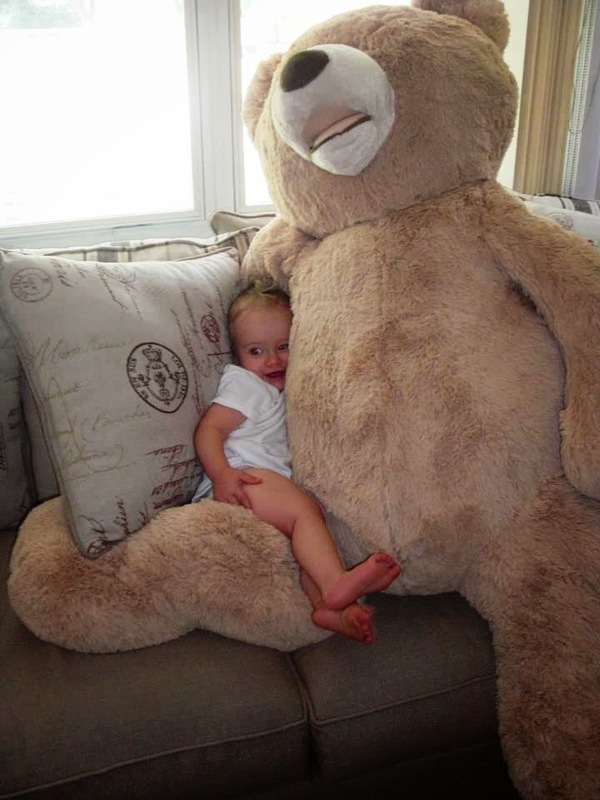 He is the excessively large teddy bear you see in the pictures below. He was given to us by a dear friend of my parents, and has become a member of our family. 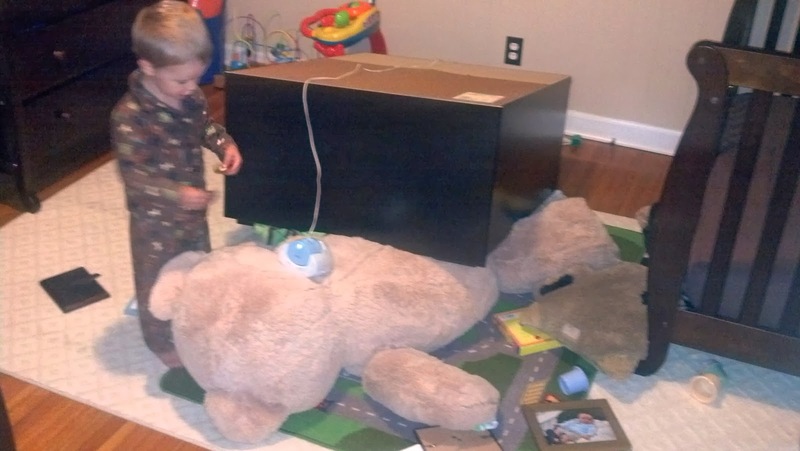 To cut to the chase, Theodore may have likely saved our little Levi's life. 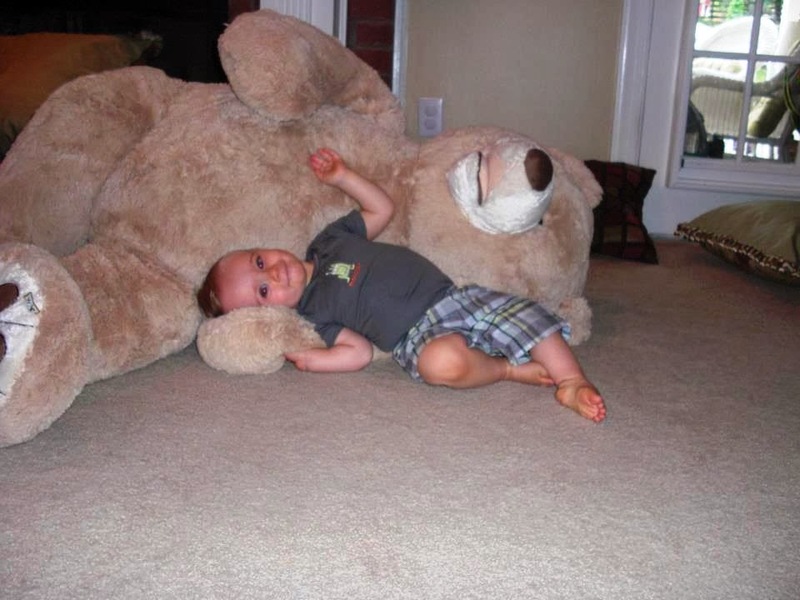 He was supposed to be napping one afternoon, but was rummaging around his bedroom instead. I believe he was in a state of joy and shock that he was allowed to roam freely following the recent transition that we'd made from crib to toddler bed. 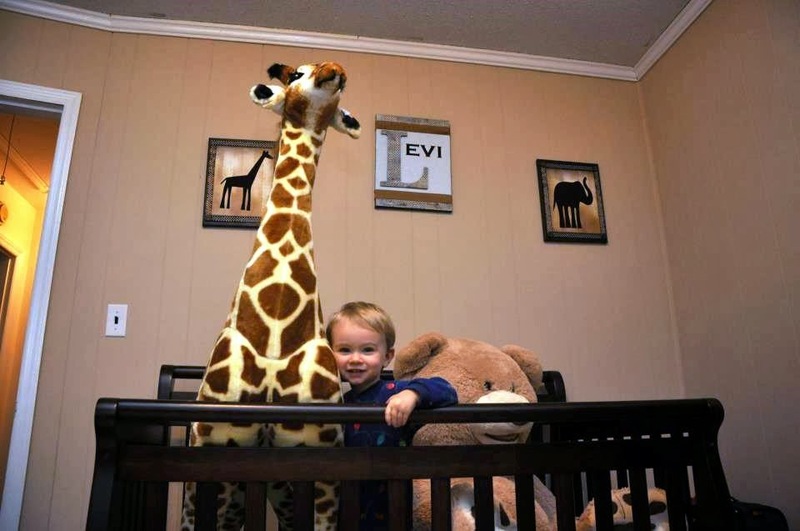 Two days prior, I had ordered a lot of furniture and television safety brackets online, and was waiting so that we could install them, but honestly I never imagined that Levi could actually even pull any of the furniture in his room onto himself. I thought I was just being "overcautious." I heard the loud thud as I was finishing a load of dishes. I literally sprinted to his room, and found him under his dresser. My heart dropped. This is a short dresser I'm talking about, one that you'd maybe never even consider harnessing. He had apparently pulled the drawers out, and climbed into them, which made it tilt forward. Amazingly, my child crawled out smiling. What had happened was a miracle. Theodore had been propped up against the dresser, and bravely took the brunt of the impact. Thank you Theodore! 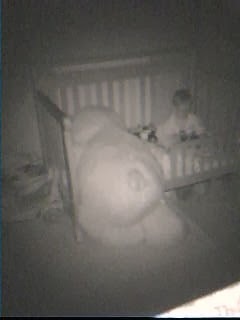 Levi came out unscathed, and his big, fat bear served a great purpose that day. I took one picture of the aftermath. You can see it below. Levi was on Theodore's side, both of them directly under the dresser when it fell. I'm so happy my little buddy was okay that day. I have felt like I needed to share this story for a long time now, as a sort of warning for anyone out there who might be in the same boat that we were before we had brackets on everything. 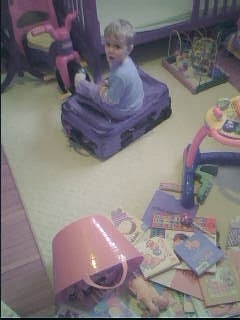 ...and while I'm on the subject of cribs and toddler beds, I'd also like to share some of my favorite video monitor snapshots with you all. 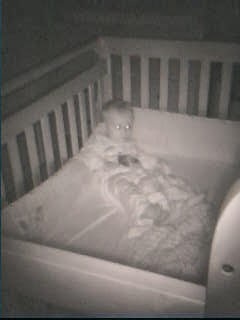 You know, the crazy moments you catch while watching them "sleep", the creepy night vision eyes your kids get, the sweet moments, and the ones where you are extremely grateful that you can see what they're up to in their rooms... Enjoy! You didn't really think I'd sleep in my crib, did you? Sleeping with your legs in the air is the best. Yep, that's a naked baby bottom. He managed to de-robe himself all by himself. Mom, it's okay if I turn the light on, destroy my room, and sit on this awesome suitcase instead of taking a nap, right? 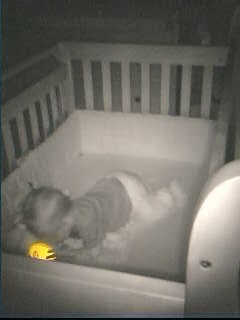 I'm not sure how he got this ball into his crib. Really, no clue. It was on the floor beside his bed. Apparently, he has skills. Taking off shirts and wearing them on your head is so much fun. And finally, here he is hanging out in bed reading during "nap time" after doing a pretty dang, good job of pulling Theodore in to join him. He's actually pretty heavy, too! This post is also being used as an entry for a Dropcam (video monitors company) contest. 1. 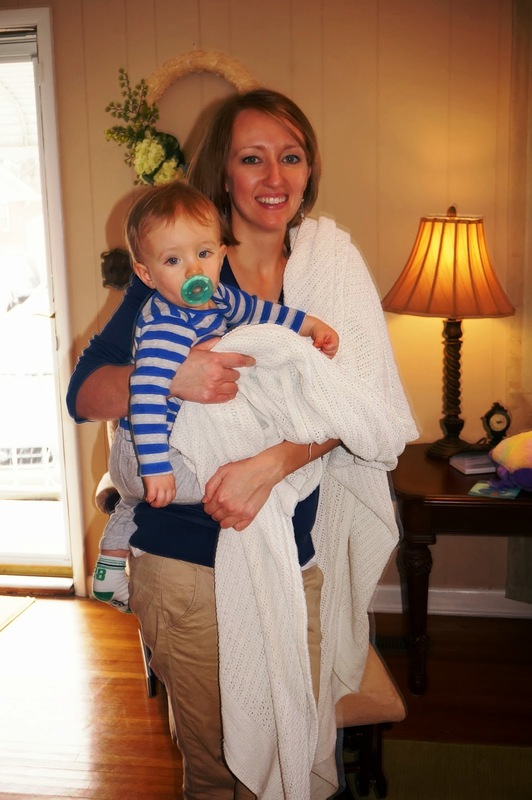 Post your “Tale from the Crib” on your blog. 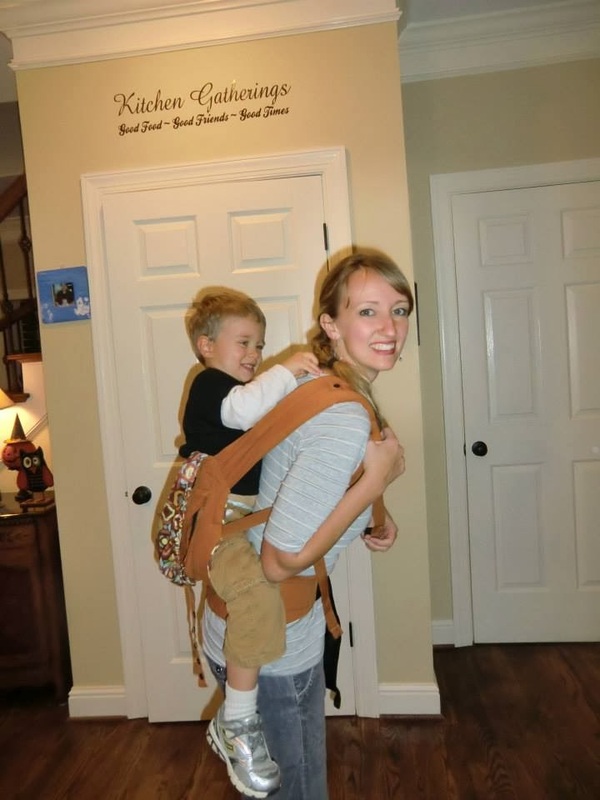 They're simply looking for funny, surprising, or heartwarming stories about moms and their children. If you have any pictures or videos to go along with it, they’d love to see those as well! Their community loves reading these stories, so they like to share the best entries on their social media accounts. If they pick yours, it will be shared with their 26,000+ active followers! They want them to shake, rattle, and roll in their seats, so please send them your stories! I LOVE my baby Jo. That's just how I had to start this blog post. 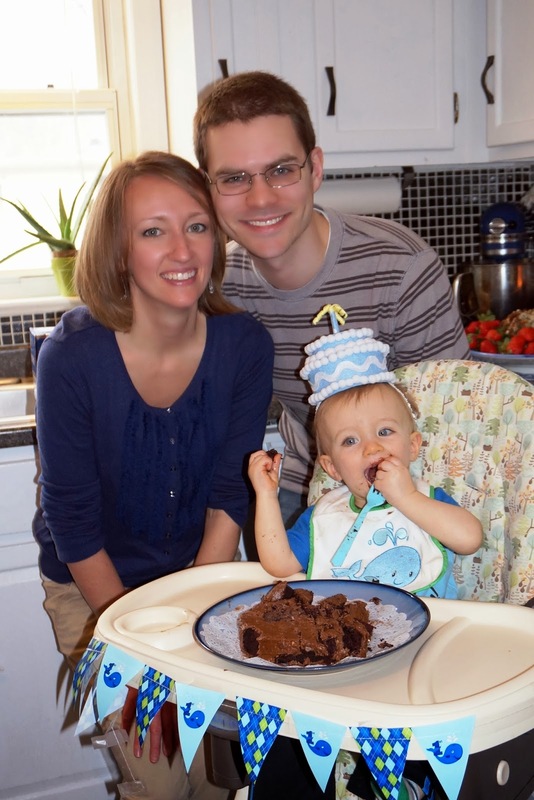 Jonah turned one last week, and we celebrated his birthday with loved ones this past weekend. 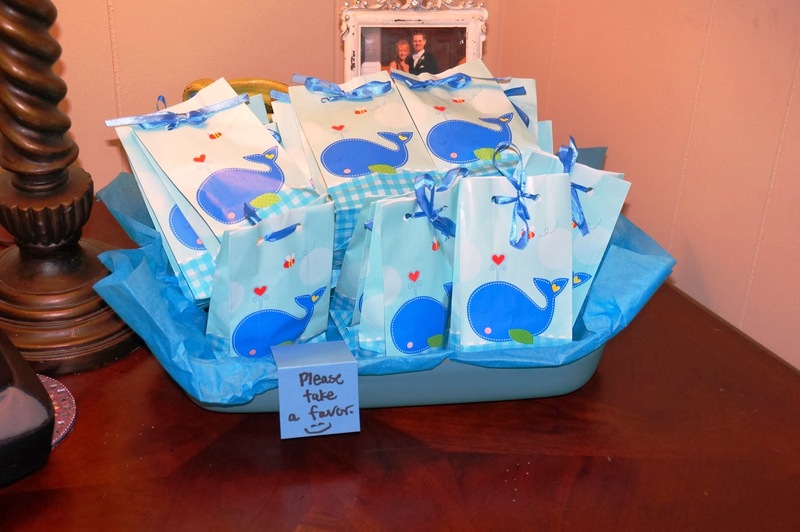 After hosting my first baby shower for a dear friend and an essential oils class in January, I felt ready to host one of my children's birthday parties at our house (also a first). 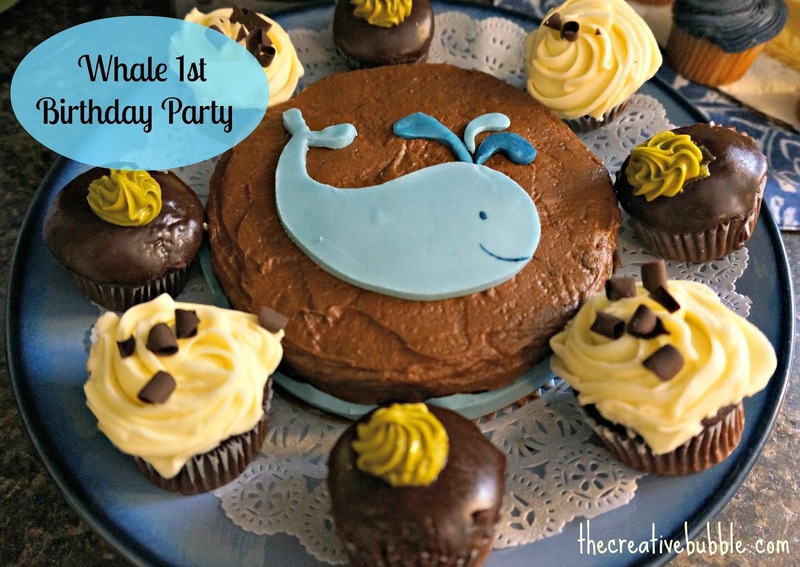 I think Jonah will probably get mad at me if I try to throw him a "Jonah and the Whale" party when he's older, so I took the opportunity to do it now, before he can put up a fight. 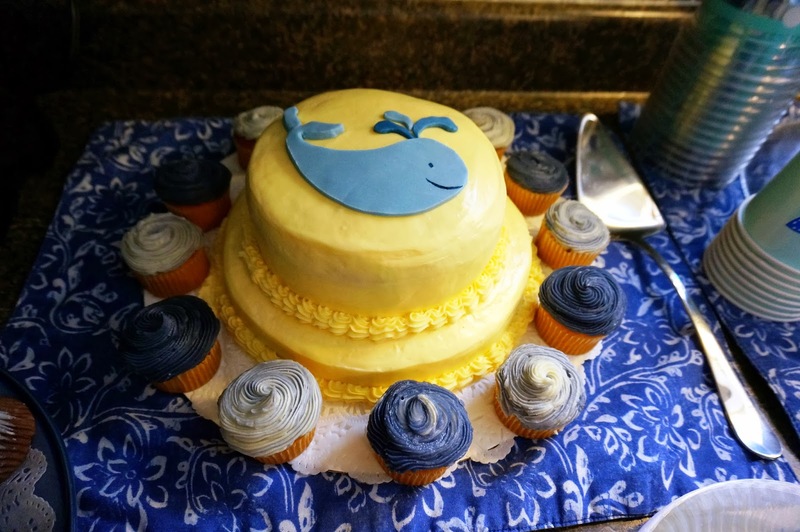 Plus, whales are cute and the theme was a good way to incorporate blue. I found most of the whale supplies at Party City and on Amazon, and I made a couple of things, too. 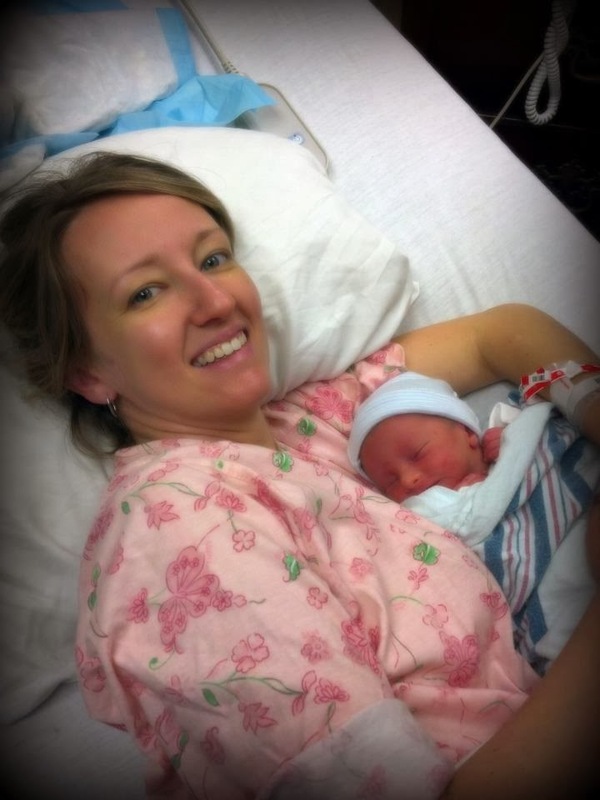 Back to the birthday boy...here he is as a newborn, and also as a big boy at twelve months! He likes to pull his month stickers off of his shirt as soon as I put them on to take his picture. I was really sad as I put the month sticker sheets in storage, because it just means he's out of the "month counting", but I still get to rock him to sleep and hold him tight, because he is a cuddle bug! I'm so grateful for that! My sister-in-law and brother-in-law gave Jonah a book called "If I Could Keep You Little." There isn't a more suitable gift (for me!) on his birthday than this book. Have you read it? We read it before bed last night, and I almost cried. It's about all of the things that the parents would miss if their child stayed small and didn't grow up. It made me want to live it up right NOW, and enjoy my boys to the fullest, because as I hear...they grow up fast. So, today we pulled out their tent, since that is about their favorite thing on the planet right now to "live it up". 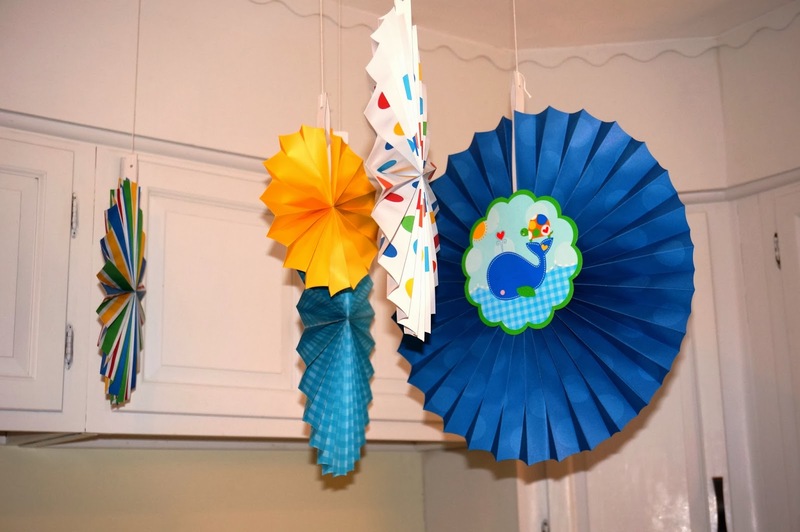 I also ordered a toddler craft book with a bunch of ideas, because we go a little stir crazy inside in the Winter, and mommy needs to get these boys into some fun activities. ...here are some pictures of the event! 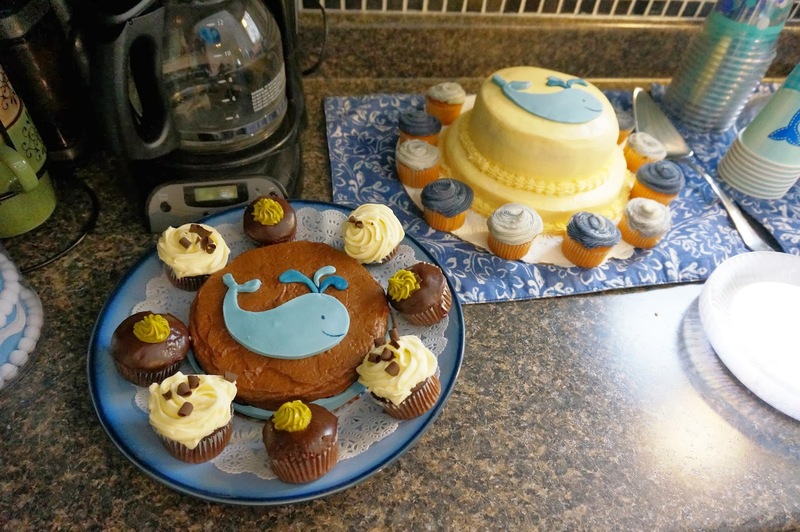 If you come across this post, and are doing a whale party yourself, please let me know if you have any questions about where I found any of the party supplies. 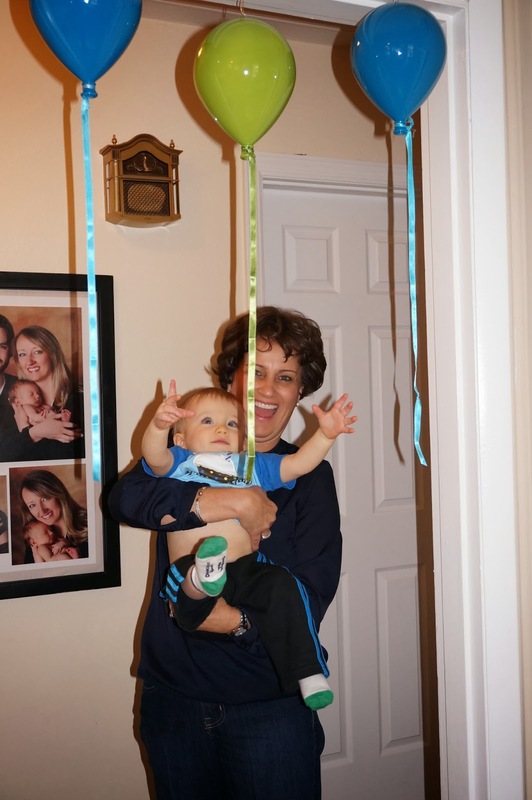 My mom and Jonah, ready to party! Big brother had so much fun. 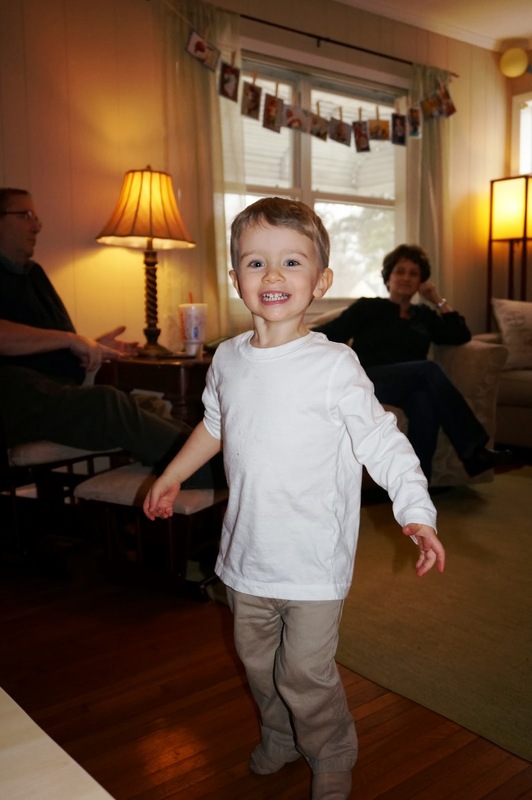 Today, he said, "Jonah wants to have another birthday party, and all the people want to come here again." I think he's a social butterfly. That's the best picture I had of this. It's made with scrapbook paper and felt. 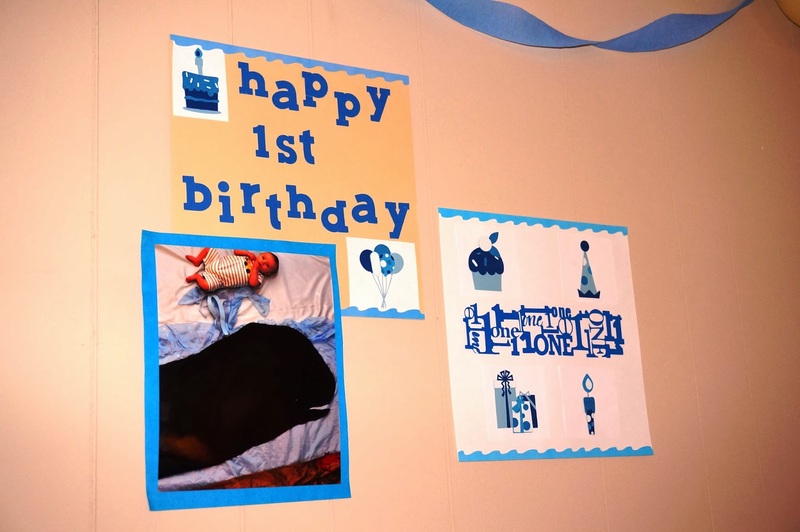 It says, "Jonah is 1! 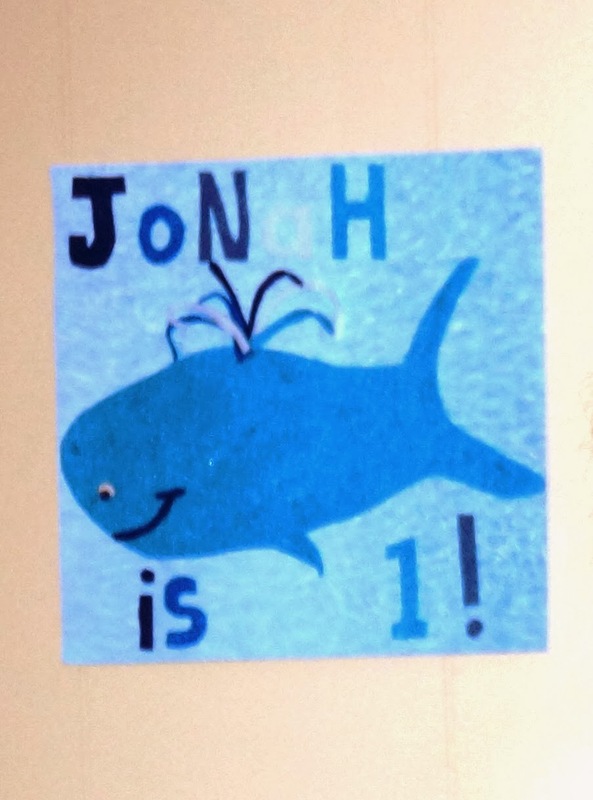 ", not to be confused with, "Jon H is 1!". He loved his cake. 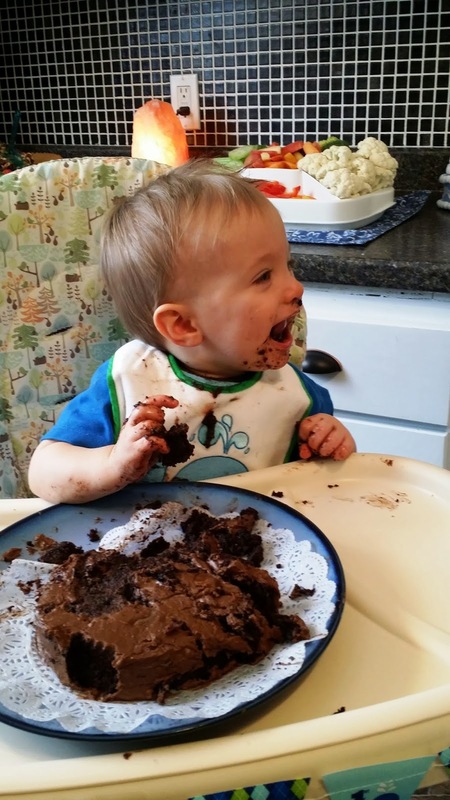 I think I'm going to do a post called "Cake Monster", so all of you can see how messy he got. He truly looked like a cake monster. 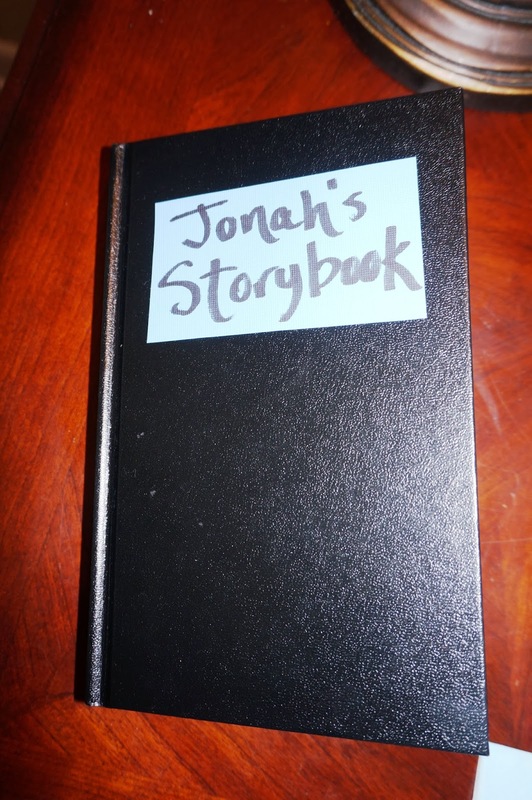 This is a book that I put some pictures of Jonah in to create a story for everyone to look at. He was so sleepy by the time it was over. 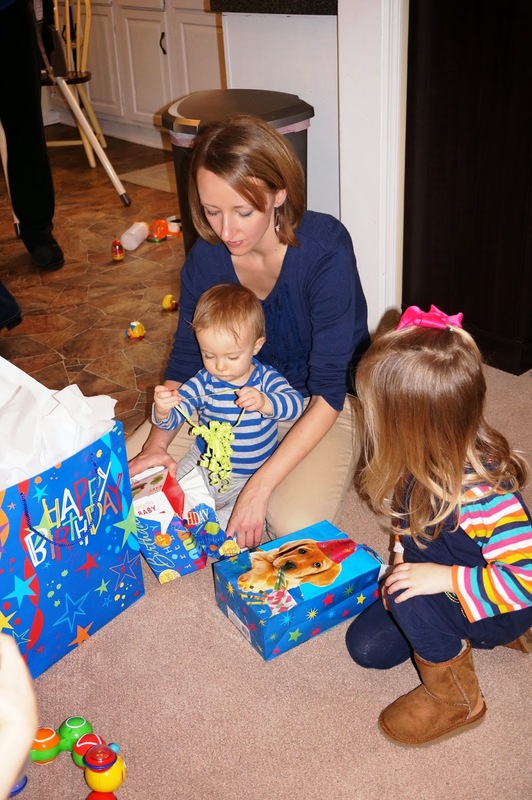 We had a fun day, and I think Jonah's first birthday party was a success. 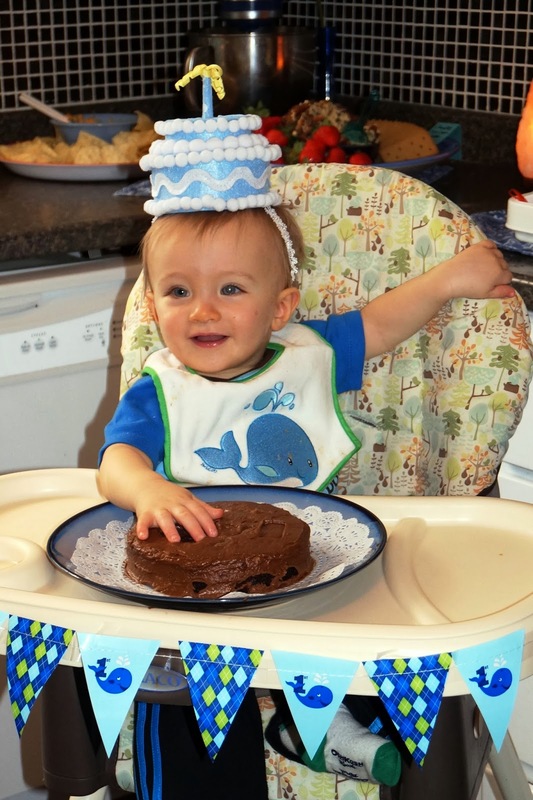 He's one!! I am still a little in shock by how fast this past year flew by, and by how tiny he still seems to me in my mind. Happy 2nd year of life, precious baby Jo Jo!